Complete the picture of the toothy T-Rex and practice your counting skills by connecting the dots from 1-45. Practice counting by connecting the dots from 1 to 33 to complete the picture of the fish. What kind of vehicles travel across the ocean? Kids practice counting to 30 as they connect the dots to find out. Should you round that number up or round it down? Help your seafarer master the art of rounding with this fun fish color by number. To find out what the horse is doing in the picture, connect the dots from 1 to 37. Practice counting and complete the picture! 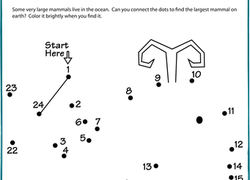 Sketch a dot-to-dot outline of a certain beloved farm animal in this worksheet. 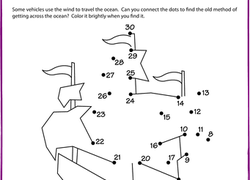 This horse dot-to-dot worksheet will help your child practice counting and more. Practice counting numbers with this fun dot-to-dot activity where you can complete and color the picture of the home. What's the largest mammal on earth? To find out, kids need to connect the dots and practice counting to 23. Simply connect the dots to complete the picture of the crawling chameleon. Counting, writing and drawing practice are wrapped up in this dot-to-dot coloring page. What Australian animal will be revealed? To find out what type of vehicle the excavator is driving, complete this fun dot-to-dot activity by connecting the dots from 1 to 39. Counting, writing and drawing practice are wrapped up in this connect-the-dots coloring page. What undersea animal will be revealed? Look at the picture and count how many stars are lighting up the night sky then add color to make them sparkle! Counting, writing and drawing practice are wrapped up in this dot-to-dot coloring page. What prehistoric animal will be revealed? Connect the Dots Dump Truck! Counting and drawing practice are wrapped up into this dot-to-dot coloring page of a truck, for when your child can't get outside with his toy cars! This beautiful butterfly needs help filling in his wings! Have your child practice counting by even numbers with this fun connect the dots coloring page. What has 83 dots and knows how to whinny? This animal dot-to-dot gets your child to sketch the outline of a show jumper, while getting some number practice too.